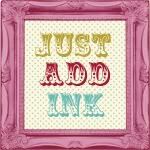 Sew N Ink: Happy New Year 2012! I'm excited for the future and its great to have a new year to learn from the past and go forward with lessons learnt to the future. And so my debut begins with my take on the first scrapbooking challenge and a little blink into our past LOL! Please feel welcome to play along and join in the fun here! This layout kick-started my play with various layouts using DSP- Letters to Santa as seen in recent previous posts. A beautiful first layout Ruth and so glad to welcome you aboard the JAI Design Team. I am looking forward to you and Delys inspiring me to scrap again!